MaltaPost p.l.c. is the postal service company in Malta. The public limited company took over the postal services previously carried out by Posta Limited, and started operating on May 1, 1998. MaltaPost p.l.c. was registered with the Malta Registry of Companies as a public limited company on 16 April 1998. It took over from Posta Limited on 1 May of that year. On 31 January 2002, MaltaPost was partially privatized when the government sold 35% to Transcend Worldwide Ltd, a subsidiary company of New Zealand Post Ltd. In September 2007 the government sold 25% of its shareholding in MaltaPost to Lombard Bank plc, which effectively became the majority shareholder in the company with 60% shareholding. The other 40% were sold to the public in January 2008. In 2011 MaltaPost carried out a series of reforms, including adopting a new logo. MaltaPost inaugurated the Malta Postal Museum in June 2016. MaltaPost issued its first stamps on 27 May 1998, and the issue consisted of a set of 4 commemorating the International Year of the Ocean. Less than a year after MaltaPost took over, in early 1999, the German company Bundesdruckerei began printing Maltese stamps instead of the local company Printex Limited. MaltaPost's first definitive was issued between 1999 and 2003, and it showed Maltese flowers. In 2004, Printex began printing Maltese stamps once again. Since then, the number of sets per year has increased and photography began to be used more often on stamps, especially in 2008-2009. Many recent issues are based on paintings (especially watercolours designed by Cedric Galea Pirotta) or photos or graphic designs designed by MaltaPost itself. Many stamps are based on local topics, and English is the predominant language on stamps. MaltaPost takes part in various stamp issuing programmes including EUROPA and SEPAC. 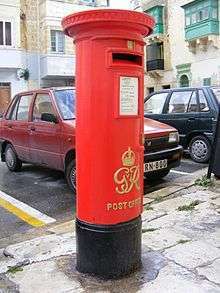 Since 2003 there have been a lot of sets with high values when standard local postage is €0.26, but although these are mainly intended for collectors, higher values are still used on parcels or registered letters since postage labels are not used as often in Malta as in other countries. Colonial pillar box in Senglea. 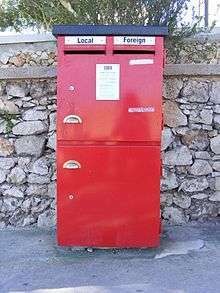 Modern post box in Mellieħa. MaltaPost Fiat Doblò Mk2 van in St. Julian's. There are 3 hubs in Malta and 1 in Gozo, each locality in Malta and Gozo is under one of these hubs. A code starting with "R" indicates a Branch Post Office (BPO), and one with "S" indicates a Sub Post Office (SPO). The latter are usually located in shops such as stationers. Currently (September 2015) MaltaPost operates 35 BPOs (including 5 in Gozo) and 28 SPOs (including 3 in Gozo). There are an additional 431 authorized stamp vendors in Malta and Gozo. Letterboxes are also found in practically every locality. MaltaPost initially continued to use postal codes as they were in the 1990s. In 2007 they changed the postcodes of all addresses in the Maltese Islands. Each code consist of three letters, that differ by locality, and four numbers, for example MTP 1001 (the postcode of MaltaPost's main complex in Marsa). Wikimedia Commons has media related to Post of Malta. ↑ The Company. MaltaPost p.l.c. Retrieved 7 July 2014. ↑ Maltapost privatisation latest red-letter day in postal history. Times of Malta, 21 January 2008. Retrieved 7 July 2014. ↑ Maltapost rebrands and offers new service. Times of Malta, 26 March 2011. Retrieved 7 July 2014. 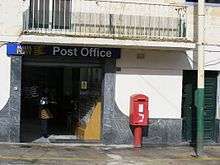 ↑ "MaltaPost launches the Malta Postal Museum". MaltaPost. 17 June 2016. Archived from the original on 21 June 2016. ↑ Search Letter Box and Outlets. MaltaPost p.l.c. Retrieved 18 September 2015.